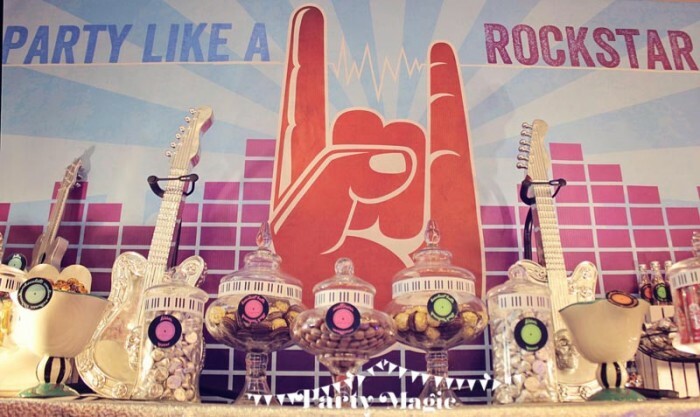 Now, this theme has got to be right up there in terms of being one of the most unique ones for any party: Rock and Roll. 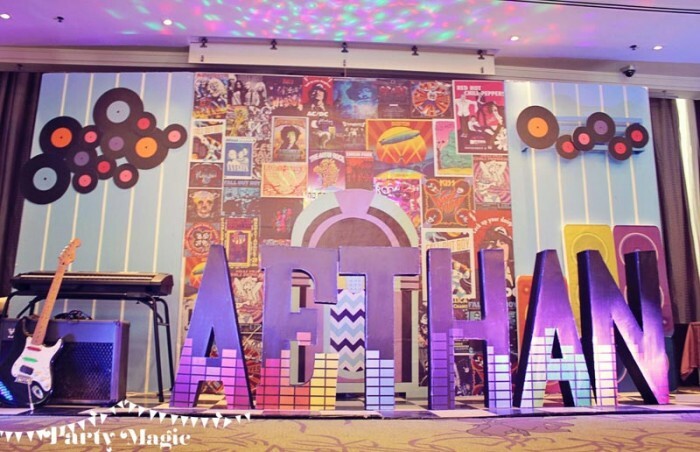 My client, Karen, insisted on this theme because her son Aethan is a music enthusiast and loves anything Rock! After hearing this proposed theme for the first few minutes, my mind was instantly bogged down with a most important dilemma: how do I make a Rock theme, with all its implications of partying, drugs and wild abandonment, kid-friendly? The first thing to tackle of course, was the color scheme. Normally, rock implies black, studs, skulls, leather, and more black. Black is really not that kid-friendly (nor happy! ), so I went for a sky blue, orange, and violet theme instead. Instead of studs, skulls, and leather, which are downright scary and a bit depressing, I decided to work with a jukebox, vinyl records, and graphic amplifiers (at the back right of the stage). 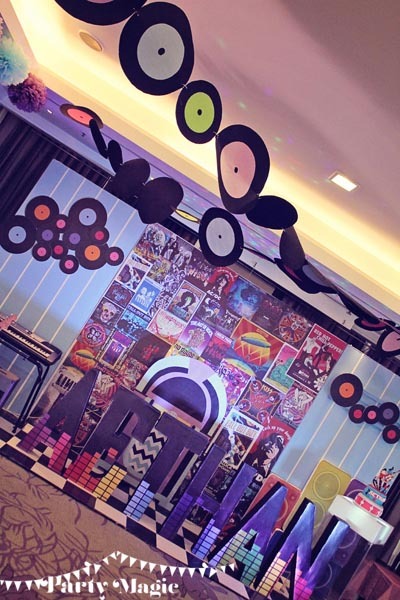 So as to provide a more realistic (and styling) feel, the Party Magic team and I displayed album covers of Rock and Roll greats such as AC/DC, Led Zeppelin, Jimi Hendrix, and the more contemporary artists like Foo Fighters and Paramore. 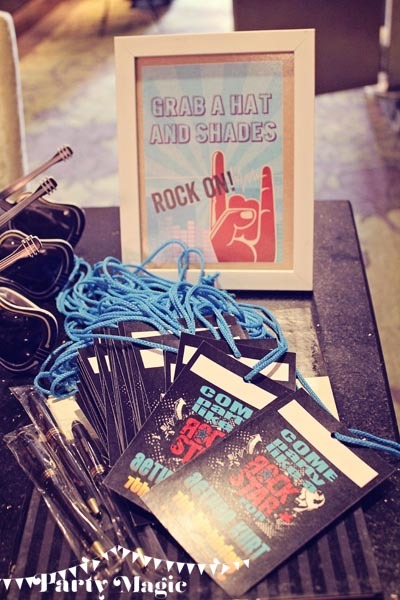 We also placed actual musical instruments such as an electric guitar, amplifier, and keyboards! My all-time favorite though, is the block letters designed in equalizer pattern! Psychedelic! 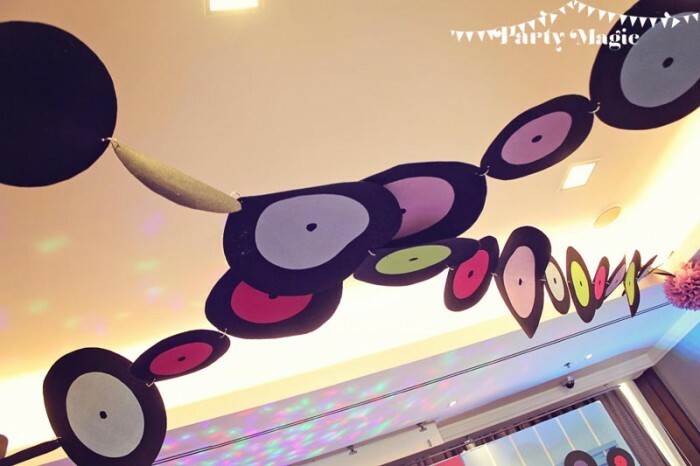 Vinyl records were also decorated as part of the ceiling treatment. 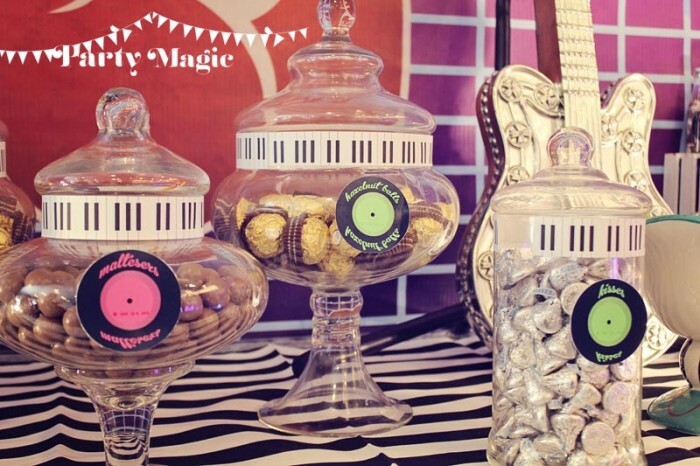 I also had fun dressing up the dessert table: containers and jars were wrapped with keyboard and vinyl record stickers. Check out those silver guitars in the background! Just love how intricately designed they are! 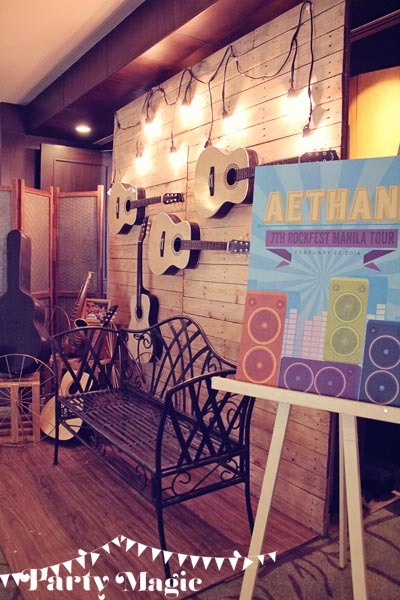 For every kid that enters the party, he or she gets shades and their very own exclusive, backstage pass to Aethan’s Rockin’ Awesome 7th Birthday! And now the clincher – For the entrance set-up, I decided to go for a softer approach and focus more on wood and natural elements. 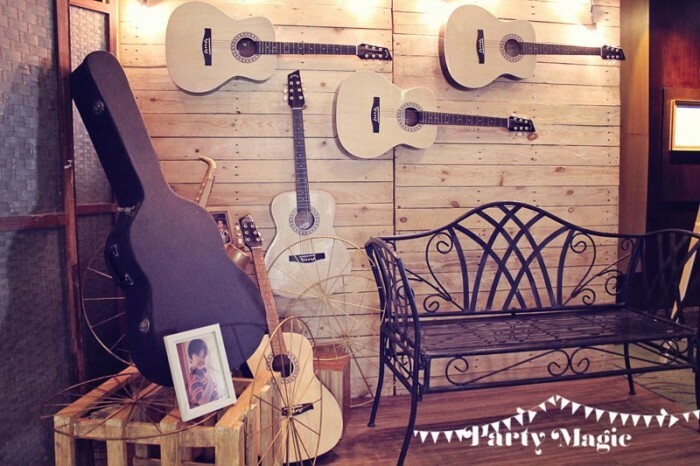 Guitars were converted from electric to acoustic. I love that park bench! It fit perfectly as a place for guests to sit down and pose for the camera.